Die Vandoren! See you in hell. Special function dominants are dominant seventh chords that do not resolve down a fifth or down a half step. These dominants have reasonably strong resolutions to tonic Imaj7 chords and can be used by the improviser or arranger as substitutes for V7 chords. Though these special function dominant chords do not have as strong resolutions as V7s or subV7s, they are strong enough to be used as subs for these chords. SFD chords can be used to create a more desired bass line or to harmonize hard to voice melody notes. They can also be used by the improviser to create interesting reharmonized lines over existing chord changes. One thing to keep in mind when you are creating reharmonized lines or chord changes is that you may always precede these SFDs with their related ii-7s. I7 this is used in blues progressions as a tonic dominant. It also sometimes resolves to the Imaj7 tonic. II7 this chord is closely related to the bVI7 and the #IV-7b5 (they all share the same tritones). It is normally analyzed as V7/V (secondary dominant function), except when it resolves directly to I when it acts as a SFD. IV7~ used in blues progressions, resolves to a I7. IV7 is diatonic to melodic minor, and has a subdominant function in that context. bVI7 ~ usually analyzed as a sub V7/V. When resolved directly to I it creates a special function cadence. This chord is derived from the chromatic harmony of the 19th century. This chord is closely related to the IV- chord, although it is not diatonic to the minor key. This chord is said to have an altered subdominant minor function. VII7 ~this is usually analyzed as a V7/III, except when it resolves directly to I. Since VII7 is not associated with any particular area within the key, its function is simply cadential. How do we apply this knowledge? As improvisers, we need to be able to create valid and functional chord progressions on the fly. Special function dominants can help us do this. This creates a delayed resolution, which is always interesting. We can use them at the very end of a tune for a candenza, right before the last chord of the tune. The best way to get used to the sound of the SFD chords is to sit down at a piano or with a guitar and play through all of them. Try playing them one at a time and resolving to Imaj7 after each one. 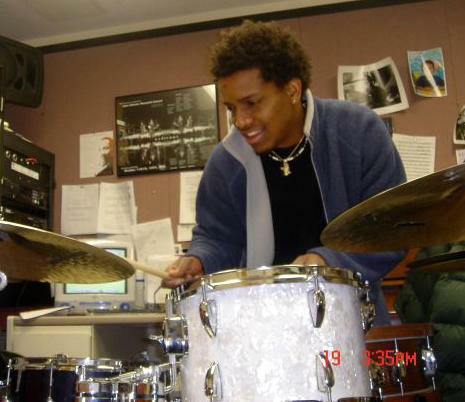 Francisco Mela is a young cuban drummer who is currently living in Boston. Here is a link to his web site, there are some good MP3s of him playing with George Garzone and John Lockwood. Here is the first audio file of my playing on this blog. This is a podcast from my gig last week with Spanish guitarist Pere Soto and bassist Dan Schulte. My personal favorite is the very last tune called Oasis. All the tunes are written Pere Soto or Lee Konitz. I have been struggling with Vandoren Java reeds for many years now. It's not uncommon for me to go through two or three entire boxes and not find a single good reed. I may find a great reed every ten or so boxes. I have heard that Vandoren has been putting their good cane into the newer brands like V16. Over the year I have tried many different brands of reeds but have never found anything that works as well as Java (when I can actually find one). Recently after getting about three boxes of Javas that were actually green and played like toenails, I decided to keep searching. 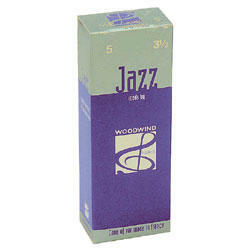 I ordered some Woodwind Paris Jazz Alto Sax Reeds. These are the Woodwind & Brasswind's generic French cane brand. They cost $7.55 (+shipping) for a box of five reeds. The first reed I took out of the box played like a dream. I hadn't played a reed that good since Javas used to come in those purple plastic boxes in the late 70's. I thought that it might just be a freak occurrence until I tried the second one. It was smoking too!!! Out of five reeds, four were really great and one was just good. INCREDIBLE! Life is good again. The creator loves me. Music is enjoyable again. My voice is back, and there is hope for the human race again. It's amazing how much a bad reed can mess up your life. Good reed=good sound=good music=fulfilling creative expression=good self image=good career=good life. If you don't play a reed instrument you can't understand how this can be true. I ordered a bunch of these new reeds. I'll going to make a door mat out of all the bad Java reeds I have sitting around my house. I would have a small fortune if I could get money back for every bad Vandoren reed I've ever bought. Die Vandoren!! Don't act all innocent when we write you about green, poorly cut, and stuffy reeds. You know what you're doing. I know you do. You'll pay in the end.